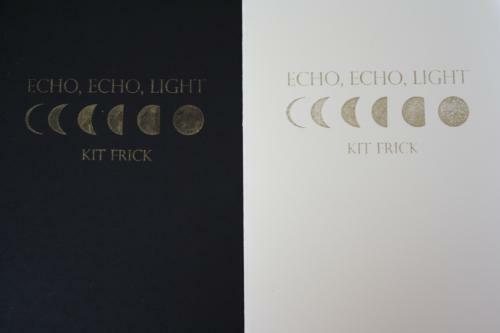 The moon is cyclical in nature and Kit Frick has brought it to a new phase with Echo, Echo, Light. The winner of the 2nd Annual Slope Editions Chapbook Prize, Echo, Echo, Light is a series of twenty poems that interrogate language, exploration, space, and the self. Expansive in subject and carefully selected language, these poems are their own contained universes. Each poem is titled for a lunar phase or terrain—the waxing gibbous moon, the terminator, and the lake of dreams, to name a few. The companion poems that orbit the chapbook’s main text define each poem’s subject in terms that are textbook and tongue-in-cheek, scientific and philosophical. A second-person point of view prevails throughout these poems. The mysterious “you” transforms just as the moon does—guide, lover, friend, self, or reader. store seems different since you were last here. This voice is familiar with the lay of the land, its denizens. This voice has been here, it can teach us. The rapid cuts to new locations, objects, and faces lend to the dreamy and ethereal, but these flickers are also sharp. The short sentences and crisp images build a clarity that makes entering each poem satisfying and oddly familiar. A live current of déjà vu also runs through these poems. We have been to these places. We have felt in love, felt lonely, felt lost (geographically and existentially). In this way, Echo, Echo, Light points to patterns, both astral and human. We go to these places again and feel these ways again because emotions are cyclical, human nature is cyclical. We are made entirely of patterns no less scientifically immune to change than the moon. Language also tends toward patterns and Kit Frick explores that music in tandem with the moon’s surface. These patterns and rhythms are reflected in the subjects and music we encounter in these poems. The poem “Lake of Sorrow” instructs how to cope with an inability to float in this mysterious body of water, how to overcome sadness, grief, depression. cordial is the salve. Some swear by fish oil. But. How mundane. How fraught with pedestrian. life is not a movie. Your life is not a movie. Whether the landscapes we feel inside us or observe outside us, the moon-world Kit Frick has brought to light is challenging and compelling. Echo, Echo, Light revises the moon’s place in poetry, revitalizes the long admired image and entity. In their thorough explorations of the lunar condition these poems approach the human one. These may be instructions to survive lunar mysteries, but they allude to our own rhythms and phases that mirror the moon’s, the landscapes of the self that are vast and mysterious as space and far planets. GINA KEICHER is an Associate Editor for Black Lawrence Press. She received her MFA in Creative Writing from Syracuse University. She lives in Ithaca, New York with her husband, their cat, and their dog. Her first full-length poetry collection Wilderness Champion is forthcoming from Gold Wake Press. Visit her online at www.ginakeicher.com. Congratulations to GMR contributor Alison Prine!